The Florida weather brings many reasons you may want to hitch something to the back of your truck and tow it along. It could be a camper, boat, horse trailer, or cargo trailer for your water toys. Whatever you’re looking to tow, here are some tips from your Winter Haven area Ford dealership that will help you do it safely. The first step to ensuring you are towing safely is to make sure that your vehicle is set up to tow with all the proper equipment. Just because your truck can get a trailer moving down the road doesn’t mean it’s capable! You need to check your vehicle’s manual to see exactly what it is capable of and pay attention to the max tongue weight and max weight carrying capacity. You also need to make sure it has a high-quality towing package attached. Determine whether it’s a sway control device or a weight-distributing hitch, or both. Make sure to double and triple check your tongue weight. This is generally 10-15 percent of the trailer’s total weight. If you need a higher rear suspension spring rate, consider using an equalizing hitch to move some of the tongue weight to the front axle. You will also need to use safety chains in an X pattern under the hitch. This will add protection if your trailer becomes unhitched. Crossing the chains under the hitch allows for stability and a tighter turning radius. Before hauling your trailer, there are a few things you should remember to do. Make sure the tires are at the highest pressure recommended, which will economize fuel consumption and allow them to run cooler. It’s also important to perform regular trailer inspections. Make sure your wiring is working appropriately and that everything looks to be in good shape. When on long hauling trips, perform inspections when you fuel up. Look to make sure the breakaway cable and harness connector are attached, and check to ensure the nut is still on the hitch ball and that the pins are still in place. Check your wheel-bearing temps as well as your tire and brake drums. Make sure to leave yourself extra time, as you need to drive slower with a heavy trailer. You have to plan corners more carefully with a trailer as well, so you don’t want to park in a place you have to back out of. 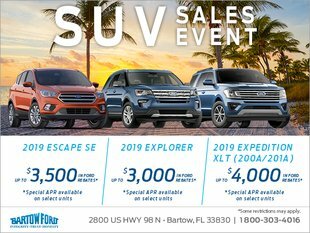 Regardless of whether you’re looking to haul with your vehicle regularly or just once every so often, your Winter Haven area Ford dealership Bartow Ford team is happy to help you get the right truck or SUV. Stop by our dealership or give us a call at 800-303-4016, and we will show you around our different models.